Sesame isn't the first smart lock on the market, but it's hoping to stand out with lower prices and easier installation. Once it's installed, the Sesame pairs to smartphones over Bluetooth, letting users lock or unlock the bolt through a companion app. The lock itself also has an accelerometer, so users can open the door with a specified knocking pattern when an authorized smartphone is in Bluetooth range. In addition to the lock, Sesame is selling a $50 Wi-Fi access point that plugs into a nearby wall. 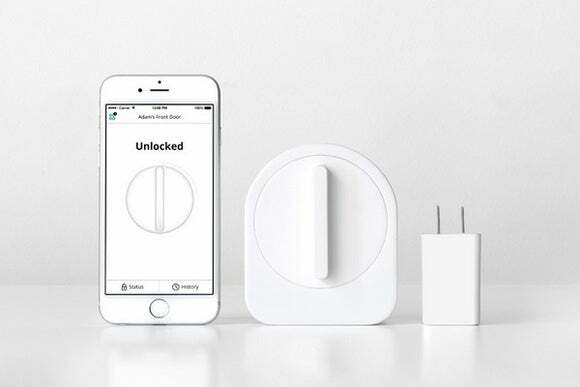 This lets users control the lock from outside the house—allowing guest access, for instance—and enables notifications when someone opens, closes, or knocks on the door. Sesame's supplied lithium batteries should last for 500 days. The app will send an alert when the batteries are low, but regular keys will still work if you're worried about getting locked out. Sesame is funding its smart lock on Kickstarter, with early-bird pricing for backers, though it's already exceeded its $100,000 fundraising goal. Estimated delivery is in May. Why this matters: Smart locks from August, Kwikset, Yale cost more than twice as much as Sesame, and they have a more components to install. (Kwikset's locks, for that matter, require a full deadbolt replacement.) We'll have to see if Sesame's stick-on system works as solidly as its more complex rivals, but it could make the smart lock a less intimidating proposition, especially for renters. Whether you actually need a smart lock is another matter entirely; but at $99, the decision won't be as agonizing.